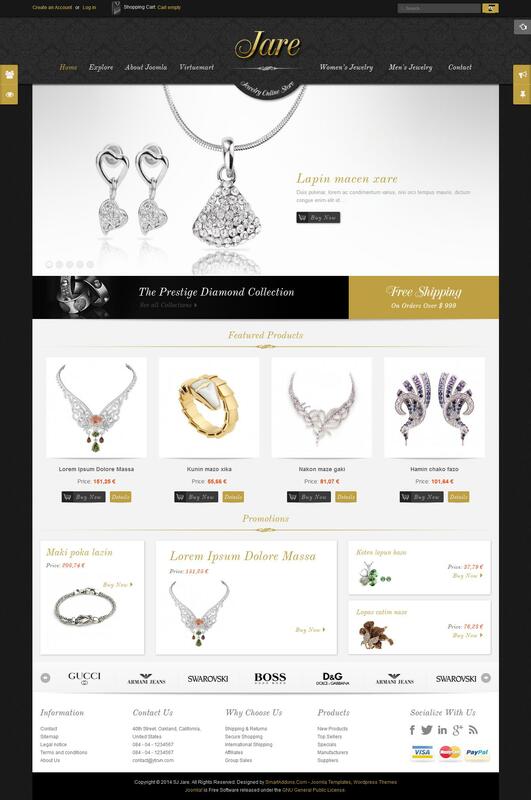 SJ Jare - elegant template internet - shop from developers SmartAddons. Luxury design template is made in soft colors, each element worked very efficiently. Availability adaptive functions allows pattern displayed correctly on all screens and mobile devices. Integrated control panel template allow to fine-tune the appearance of the layout according to your requirements. As a tool for online commerce has been a popular ingredient used Virtuemart, with a full set of functions for the sale of goods through the site. In the assembly includes additional extensions best studio: SJ Basic News, SJ VirtueMart, SJ Slider and SJ VM Slideshow Responsive, allowing visually stylish and provide information to users of the site.